For a harmonious environment within your timber frame home, incorporate some of the following principles to enjoy the benefits of feng shui. Creating a healthy environment based on a natural balance of earthen materials, rich and subdued colors and a flow of energy that rejuvenates and revitalizes the soul are the key principles of Feng Shui. A Feng Shui consultant begins at the home site and actually determines the optimal placement of the home based on several calculations. “It is believed that when a home is laid out and designed correctly according to the principles of Feng Shui, the steady flow of well-balanced energy allows for greater creativity, prosperity and success in our lives and in our relationships,” remarks Simona Mainini, Doctor in Architecture & Feng Shui Master in Beverly Hills, Calif. The experts say that our homes are extensions of ourselves and when they are filled with unnecessary clutter, void of a wide array of color, lacking in the elements and unbalanced among its surroundings, these issues transcend into our daily lives. “A Feng Shui professional can often determine what’s going on in a person’s life just by looking at their home,” states Candace Czarny, CFM, LEED AP, ASID, Feng Shui expert and president of Wind & Water, Inc., in Sedona AZ. If you have ever walked into a home, room or building and felt as though you wanted to stay, yet you were not sure why, then you should learn more about Feng Shui. Our instincts often drive our design decisions and choices, yet we can’t always determine why we feel so strongly about our ideas. Feng Shui experts agree that these “feelings” reflect the presence of positive life energies. Homes which exhibit this energy, not only help us enhance our personal well-being and success, but they also exhibit greater appeal to others. “Feng Shui designed homes are often the first to sell because people walk right in and feel at home,” comments Astrid Newton Rush, ASID, is a licensed interior designer with 20 years in practice both in the United States and Europe. Jayme Barrett, Feng Shui expert and author of Feng Shui Your Life, recommends that people begin by visualizing themselves inside their future home. Jayme offers a few fundamentals to help us on our path of Feng Shui. * Sunlight: Think about how much you need and where you wish to see the sun rise in the mornings and set in the evenings. * Nature: One of the most important aspects of Feng Shui is our ability to bring the outdoors inside. Windows play a large role in design because they provide our views and help to make us feel one with nature. * Color: Color plays an integral role in Feng Shui because it has the ability and energy to enhance our moods and emotions. Each of the five elements is represented in colors as well as textures, and thus when well-balanced, colors can sooth, stimulate and excite our senses. If you are someone who likes to really relax in your home, then choose greens, blues and mauves in your special area or room. “White actually pushes you out of a space because it has no energy. 1. Rules of placement & 2. Chi Energy Flow The rules of placement refer to the location of doors, windows, rooms and furniture and how each relates in energy flow, or Chi, to the other area. An entrance can be a very critical element to a home’s ability to maintain its energy. One rule of thumb is to never allow your entry to open directly onto the main living area of the home. Create a natural barrier by adding a wall, furniture or plants. “When energy enters a space you want it profound and strong and you don’t want it to escape,” explains Astrid Newton Rush. 4. The Five Elements Natural elements possess their own energy because they come from the earth. Yet, just as in nature, there has to be a balance. “Too much of any particular element, such as wood, stone or metal can create an unsettling feeling and thus interrupt a home’s harmonious feel,” says Candace Czarny. 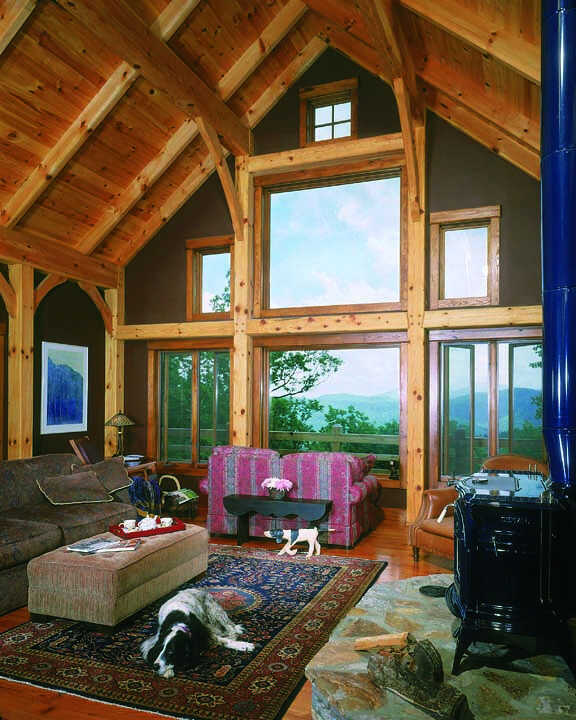 The Summer 2008 issue of Custom Wood Homes magazine featured tips on how to design each room in the home in the Feng Shui style.